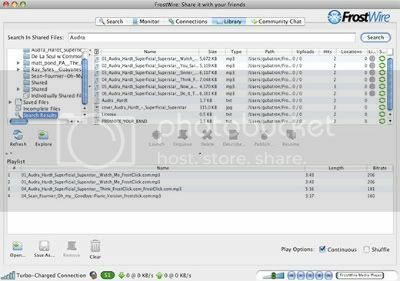 Frostwire utiliza la red Gnutella pero además es totalmente compatible con la red Bittorrent. * Soundcloud integration (Search, Streaming and Downloads). download or see the contents of the torrent. * UI Improvement: Creation date for non-torrent search results available. * UI Improvement: File size of non-torrent search results available. to the Library Settings pane. shows the only action available (Repeat Search) directly. will make sure the file is saved with the .torrent extension. * Fixes issue	with file names	downloaded from	FrostWire for Android. * Fixes issue	adding new radio stations to the library. * Fix of MP3 ID3 tags unicode parsing. Para instalarlo en Ubuntu, pueden consultar su página de descargas donde encontrarán el paquete deb.